Yesterday at 12:32 AMOn Monday, April 29, 2019 at 4pm Arizona time, the Alumni Special Interest Group will be featuring Dr. Kristina McGaha as their next Webinar speaker. Kristina McGaha has been an alumni member of the University of Phoenix twice over – first in 2009 when she completed her MBA and more recently in 2018 when she received Doctor of Management in Organizational Leadership. She has spent over fifteen years performing business analytics, operations management, and leading teams to success. Kristina has also been a corporate trainer, speaker, and teacher. She has presented and published her research about Generation Z both nationally and internationally. Having worked on two continents, she enjoys traveling as well as infusing global perspectives into her research. She currently serves University of Phoenix as an alumni research fellow and serves her community as a Policy Council member for the local school district. Additionally, she mentors small business owners and other Phoenix doctoral students. Dr. McGaha will briefly describe her experiences along the doctoral journey and how they have served to advance herself personally and in her career. Specifically, Dr. McGaha will discuss the collateral benefits of a doctoral degree – the stuff not printed on the little piece of paper. She will also share examples of how her newfound know-how has benefitted her work and her community. After a five year journey, I get to walk in my commencement today! I am so thrilled to meet faculty and peers in celebration of our dedication and hard work. Best of luck to everyone in their future pursuits! As the first blog entry of the new year, let me say that I am thrilled for what lies ahead. My besties, Generation Z, are gaining momentum both in academic research and as a hot topic for organizational strategists. I am also beginning to see incremental progress on all of my writing projects - including final decisions being made with two of my articles (fingers crossed). With all of the motivation and good vibes I received during the holiday season, I hope to share it with everyone who find themselves pursuing knowledge and advancement of any kind. The weather outside is rainy and my brain is storming too. I love getting together with peers and mentors to mutually discuss business trends, new research, plans for research, and opportunities. We kicked off today with new information about consumer behavior and a new study about Gen Z in the workplace. Tomorrow we will present Gen Z and the triple bottom line - a study we hope to get funding for soon. More details on the findings of that study will be made available once data is finished being collected. I am so thankful to be able to attend conferences and even more humbled to be asked to present my work. In the meantime, stay classy y'all (as they say in Texas). 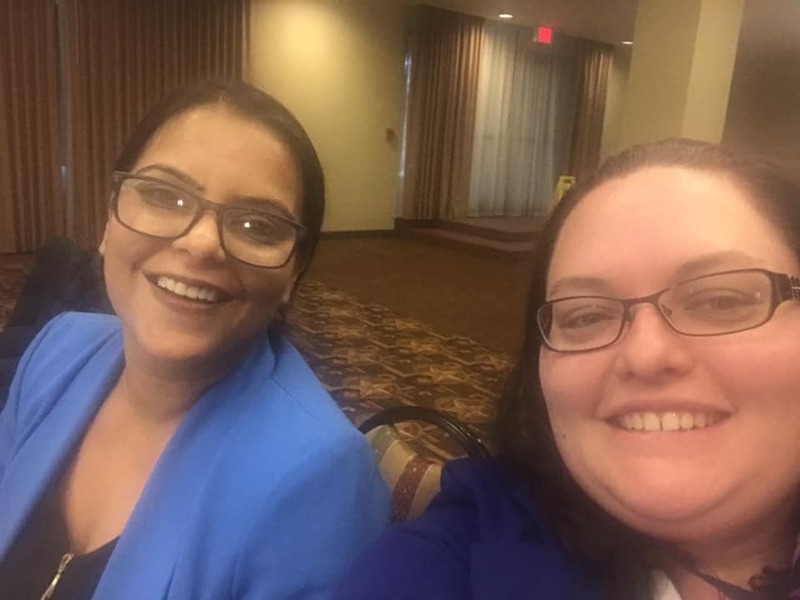 My research partner, Unnatti Jain, and I - doing the obligatory pre-conference selfie! Advocating for my fellow doctoral scholars is something I think every graduate should pursue. There is a sense of obligation, of course, to help out our comrades in arms, but it is also part of my core beliefs that humanity is at its best when knowledge is shared. and one participant added that better processes needed to be established to provide sponsorship of students to faculty, as well as steps to dissertation completion. The prevalence of faculty mentorship being identified as an institutional issue was a humbling reminder of the vital role faculty play in the overall experience and success rate of doctoral students. As universities innovate and adapt to the virtual schema, we cannot forget the interpersonal relationships that are integral to the academic journey. I recently relocated to the Pacific Northwest and have been enjoying every minute of it! What has made the move even sweeter is the opportunity that has been presented to me to oversee the Policy Council of the Ada County Head Start program. As a parent with children who have used this program, being able to assess and develop policy for early education programs will be quite rewarding. One of my mentees and I will be presenting at conference this fall (more on that later). We began discussing their dissertation study and the issue of scope creeping. The problem statement is perhaps the most important concept to understand and acquire as a researcher. Learning how to avoid scope creep is part of that. I first heard about scope creeping from Dr. Holly Rick at my first doctoral residency. She explained that too often students will try to address a problem too broadly - or rather, the problem they identify is too broad to effectively design a research study. Picture it like an hourglass: the background of the study is broad (establishes the environment in which a problem exists). The research problem identified is specific, concise, and addresses one facet of a greater issue. The study that you conduct exists within the scope of the problem. However, once the study findings are disseminated, they can potentially be applied back to the larger phenomenon which exists. In fact, a thorough discussion of findings would include the implications of those findings on professionals, scholars, society, etc. Scope creep can be identified through editing, reflection, peer review, and practice.